It is unfortunate that the origins of Odd Fellowship have been lost in time… The question of when and where our Order first originated, and how the name was first chosen can never be answered with absolute certainty. It has been speculated that the order originated during the reign of Nero in the year 55 AD, but there is no documented evidence. The first recorded meeting of an Odd Fellow Lodge was in the year 1745, at the Oakley Arms in England. In those days it was common for working men to meet at local taverns for evenings of social recreation. But as time passed, a particular group of men found a common purpose in aiding each other. They began to establish funds through regular collections to assist members out of work or in distress. It is believed that this is when and how the name Odd Fellows was attained. In those days, it was customary for the aristocracy to form philanthropic societies, but it was unthinkable for the common labourer to do so, and to meet in a tavern was very odd indeed. Another theory comes from the custom of skilled labourers banding together for mutual assistance. Feeling left out, a group of odd labourers formed their own union. Regardless of how or when our Order actually originated, it was most likely considered odd then, as it is now, for men to dedicate themselves to the relief of distress, to educating the orphan, and to compassionately caring for under-privileged and less fortunate members of our society. It is still regarded as odd that men would freely give of their time, in aid of the less fortunate. No matter how we began, the Independent Order of Odd Fellows proudly accepts our name, which has survived more than two centuries and is honoured and respected in Canadian communities and around the world. Today there are nearly 5,000 Odd Fellow and Rebekah Lodges all across Canada, the United States, Australia, Belgium, Chile, Cuba, Denmark, Finland, Germany, Iceland, Netherlands, Norway, Puerto Rico, Sweden, Switzerland, and Venezuela. August 10, 1843 – Twenty-four years after the birth of the American Order in Baltimore, the first Odd Fellowship lodge was instituted in Canada – Prince of Wales Lodge No. 1 in Montreal, Quebec. It received its charter through the efforts of two American Odd Fellows living in Montreal. They petitioned the Grand Lodge of the United States for a lodge charter and were eventually granted one after some very serious soul-searching and deliberation. Within fifteen months, there were three lodges in the Montreal area. They petitioned and received a charter to operate as the Grand Lodge of Canada under the leadership of Grand Master W.M.B. Hartley. Then began a brief period of prosperity in Canada. The Order spread rapidly to become a fashionable and popular society. Montreal was the capital of Canada in 1843 and there were many prominent elected Members of Parliament amongst the Odd Fellows. The lodges became private social clubs where members could retreat from their hectic daily lives in Parliament in order to enjoy some private male activity. During the formative years, the members who engaged in parliamentary activities were strong free-thinking nationalists. Having learned of the change approved by the Grand Lodge of the United States, they felt that their Canadian operations should be even more independent. They petitioned the Grand Lodge of the United States for ‘sovereign status’ as a quasi-independent jurisdiction. Subsequently they received this authority (with some limitations on their powers) as the ‘Grand Lodge of British North America’. The new Grand Body was the first of its kind, and included the Odd Fellow and Patriarch branches in Canada. At the peak of its short-lived history, the Grand Lodge of British North America chartered four Grand Lodges and twenty-eight Odd Fellow lodges including one in Nova Scotia. However, the burdens of the organization may have been too heavy, or the novelty may have worn off on the senior officials, because they began defaulting on their responsibilities to the subordinate members of the Order. All the lodges in the city of Montreal formally disbanded in 1853 and the debts of the Grand Lodge had to be paid off by the subordinate lodges who remained. The leadership walked away from the charter, and finally in 1854 the Grand Secretary of the Grand Lodge of the United States came up for a visit to Quebec City. He tried to ascertain whether any hope was evident to resuscitate the Order in Canada. Unfortunately, there was no positive evidence for reviving the charter of the Grand Body in Canada. The Grand Secretary reported these facts to the Annual Session of the Grand Lodge of the United States and recommended that the seven orphaned Odd Fellow lodges in Ontario and the one in Nova Scotia be brought under the umbrella of the Grand Lodge of the United States. Thus, the short career of the first independent sovereign jurisdiction ended. Since then, the Order in Canada with its seven jurisdictions has continued to operate under the Sovereign Grand Lodge. The Province of British Columbia, on the Pacific coast of Canada, consists of what were formerly two colonies – Vancouver Island and British Columbia or ‘New Caledonia’ – which were united under the name of British Columbia in 1866, and became part of the Dominion of Canada in 1871. Originally occupied by the Hudson’s Bay Company for hunting and trading purposes, the first immigration of any importance was in connection with the rush of gold-seekers in 1857, and again in 1862. On both occasions, the “boom” dropped suddenly, but left behind a number of sturdy settlers of all nationalities who formed the nucleus of a more steadily growing population. Among these were some Odd Fellows from California who as soon as they felt themselves permanent residents, were naturally desirous of organizing a lodge. The fact that the Order in the jurisdiction from which they hailed understood the situation and was anxious to forward their wishes, is shown by the fact that, at the session of the Grand Lodge of the United States in 1863, a resolution was submitted by the California Representatives, asking that the colony of British Columbia be attached to the jurisdiction of California, pro tempore; and that the Grand Lodge and Grand Encampment of that state be authorized to institute subordinate bodies in the colony, on receipt of the proper applications. This resolution met with the approval of Representative Hovey of Oregon, the nearest jurisdiction, and of Representative Bingham of Canada West, the leading British American jurisdiction, and was adopted. Introduction of Odd Fellowship. – The dispensation for the first lodge in British Columbia, was issued by the Grand Lodge of California on the 27th of February, 1864, and was sent to Brother James S Drummond, who had been the leading spirit among the local Odd Fellows; he was appointed District Deputy Grand Master. The lodge, Victoria #1, was instituted by Brother A H Guild, a special deputy, on the 10th of March, 1864. 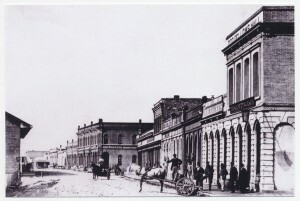 It is believed that this was the first benefit society organized in the province. Victoria Lodge made fair progress, but was rather too conservative in its ideas to suit its more enthusiastic members, and after a few years, some of them “swarmed” from the old hive. On February 15, 1870, Brother Drummond instituted Columbia Lodge #2 with eight charter members. It commenced with twelve initiates the first night. As soon as they had a second lodge, some of the brothers began to think of an encampment, and four patriarchs sent a petition to the Grand Encampment of California for a charter. That body granted the petition, and Past Chief Patriarch Miller was sent to British Columbia to confer the patriarchal degrees on six brethren. These members, along with Patriarch J.S. 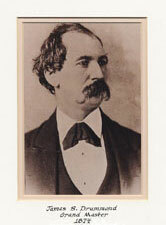 Drummond, constituted the charter members of Vancouver Encampment #1, instituted on the 24th of January, 1871. The Grand Lodge of British Columbia. – For some time, no more lodges were organized in British Columbia, and the brethren felt that if the Order was to make any progress, it should have home rule. California was too far away. Of course the law of the Grand Lodge of the United States required ten subordinates to constitute a Grand Lodge, but it seemed to the British Columbia Odd Fellows that their special circumstances called for exceptional treatment. They therefore sent an urgent memo to the Grand Lodge of United States at its session in 1871, defining the situation, asking for a charter, and offering to pay the expenses of their representative until such time as they had the requisite ten subordinates. The supreme body, however, with its usual conservatism, refused to grant the petition. Representative Woodyatt of Ontario, ever watchful of the interests of Odd Fellowship in all parts of Canada, offered a resolution authorizing the granting of the charter, but failed to secure its adoption. By the next year however, a fourth lodge – Dominion #4 in Victoria – had been instituted, and the petition for the Grand Lodge charter bore signatures of a majority of the members – two hundred and eight out of three hundred and sixty. Under the peculiar circumstances of the jurisdiction, it was thought best to grant the charter. About the time that the Vancouver Encampment was organized, the Order stepped from Vancouver Island, and gained a foothold on the mainland – New Westminster Lodge #3 was instituted at New Westminster on March 22, 1871. It became necessary at this time for the Grand Lodge of the United States to settle a question of jurisdiction which had given rise to some confusion. British Columbia had been attached to California before the lodges were instituted, and the Grand Lodge and Grand Encampment of California proceeded to institute subordinates as though they were part of their own state. This condition, though under the circumstances of great benefit to the Order, was clearly in contravention of the Constitution of the Grand Lodge of the United States which secured to that body the right of jurisdiction over all states and countries where no Grand bodies existed. Accordingly, at the session of 1873, the legislative committee defined the rights and powers of the respective bodies, establishing the law and practice to be thereafter followed, that in all countries where no Grand Lodge existed, the Grand Lodge of the United States, alone, could charter a subordinate; and that, after being chartered, such subordinate might, at its own request be placed under the jurisdiction of the nearest Grand Lodge. This was adopted, and all subordinates chartered by Grand bodies outside of their own boundaries, received new charters in lieu of those previously held. Thus the four lodges in British Columbia received new charters directly from the Grand Lodge of the United States. A fifth lodge, Black Diamond #5, was instituted on April 7, 1874, and on April 25th, the “Grand Lodge of B.C.” was instituted by Past Grand Representative A Noltner of Oregon. Brother James S Drummond was the first Grand Master. In Victoria, local brethren strengthened their position by the erection of a large and commodious temple – Lodges #1, #2, and #4 formed an Odd Fellows’ Union for the purpose, and the corner-stone was laid April 28, 1879. The dedication took place on the 11th of March the following year. In 1883 the Grand Lodge of B.C. organized its first subordinate, Harmony #6 at Wellington. On April 11, 1884, an auxiliary endowment association was organized. In 1887 two new lodges were instituted, and the first Rebekah lodge, Colfax #1, was opened in Victoria on the 15th of December of that year. The Grand Encampment was instituted on March 28, 1891, and a canton was mustered in 1892. Source: “History and Literature of Odd Fellowship: The Three-Link Fraternity” by Fraternity Publishing Co. 1897. Henry Leonard Stillson, Editor-in-Chief; Frederick Davie of Victoria & J.B. Ballantyne of New Westminster, Contributors.